Several technologies can assess bone density, but the most common is known as dual energy x-ray absorptiometry (DEXA). For this procedure, a machine sends x-rays through bones in order to calculate bone density. The process is quick, taking only five minutes. And it's simple: you lie on a table while a scanner passes over your body. While this technology can measure bone density at any spot in the body, it is usually used to measure it at the lumbar spine (in the lower back), hip (a specific site in the hip near the hip joint), and femoral neck (the top of the thighbone, or femur). 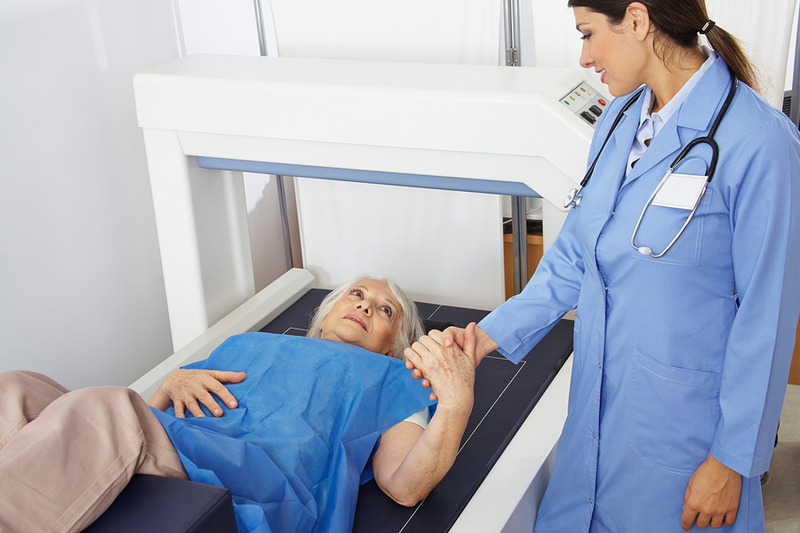 DEXA accomplishes this with only one-tenth of the radiation exposure of a standard chest x-ray and is considered the gold standard for osteoporosis screening—though ultrasound, which uses sound waves to measure bone mineral density at the heel, shin, or finger, is also used at health fairs and in some medical offices. • If your T-score is –1 or greater: your bone density is considered normal. • If your T-score is between –1 and –2.5: you have low bone density, known as osteopenia, but not osteoporosis. • If your T-score is –2.5 or less: you have osteoporosis, even if you haven't yet broken a bone. For more information on your bone health, buy Osteoporosis, a Special Health Report from Harvard Medical School.